Meet the 16 best safari horses in Southern and Eastern Africa; from the brave, ‘rock’ Tsingtao who boxes at a charging elephant, to quirky camel jumping Fidelio, to internationally travelled racing star Bon Jovi, to Olympic eventers’ choice San, and the caring Rafiji who sensed her rider’s epileptic fit. 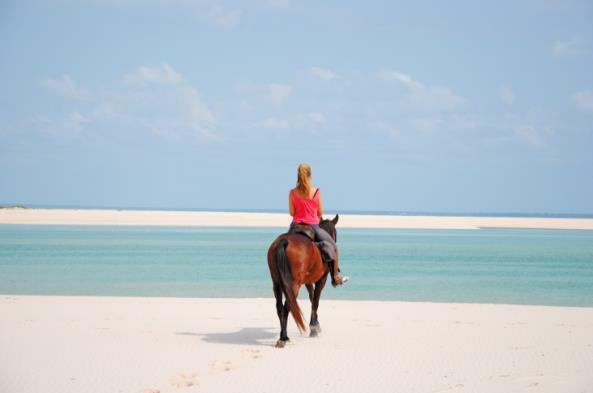 Tales of a safari horses, told first hand, by their expert riding safari guides…. 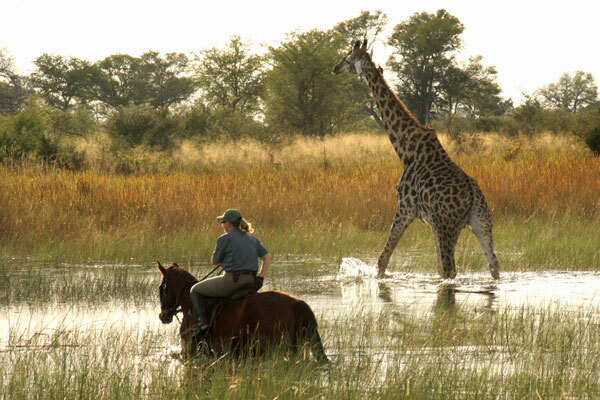 By Duncan, Okavango Horse Safaris, Okavango Delta, Botswana Royal Count is a thoroughbred gelding from Zimbabwe. Bred to race he has impressive blood lines, Full Coloured being one. 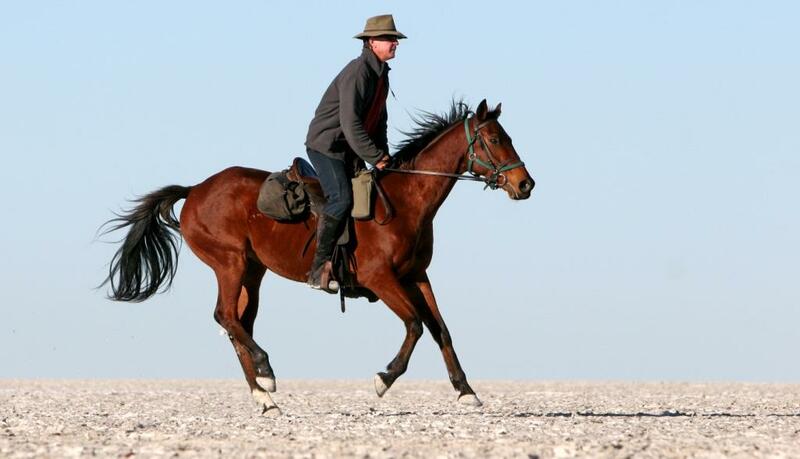 He’s a big bay, forward going horse with a mane the envy of anyone who admires long, thick jet black hair. It is his great attitude to life that is his draw card, when you sit on him there is tremendous feeling of harnessed power – it is a fine line but he always listens although the energy is touch button light. Royal Count was stolen from us, led out his stable at Guma lagoon in the dead of night and galloped away. Over the next 10 days we did everything possible to find him but he had vanished into thin air. We followed his tracks until we lost them, searched by air and on the ground, and found nothing. We consulted a witch doctor who took his old dung and mixed it in a bag of bones and dried frogs (among other things!) and then declared the horse was still alive and not far away. I should have realised that still alive meant he was nearly dead. We printed a poster and offered a reward. Soon after this the police were given a tip about a “fresh” horse being ridden pre-dawn and last night in one of the villages. A midnight raid was organised and the thief was caught. The thief was taken to tribal court two days after the raid and imprisoned for stock theft for five years. 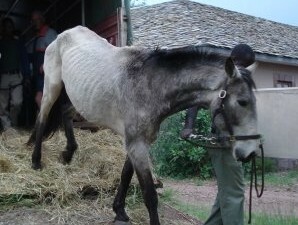 Royal Count was hidden in the bushes behind his hut without food or water; the change in this horse was unbelievable, after 10 days he was skin and bone having been galloped into the ground. The thief had cut off his ears to disguise him and burnt his forehead in the hope that the new hair would grow back grey and give him a blaze. He had also been ridden without a saddle and had a large open wound on his back exposing his back bone. 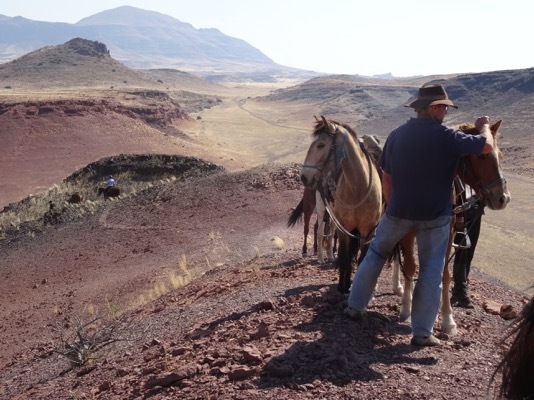 His belly and the insides of his thighs were covered with strange deep cuts probably the result of being galloped over thorn bushes – acacia Karoo which sliced him up. On top of this he was covered in diesel oil which made him look much darker and a lot of his hair had fallen out. Royal Count was almost finished, so depressed and flat I wondered if we would ever bring him back to his previous personality. 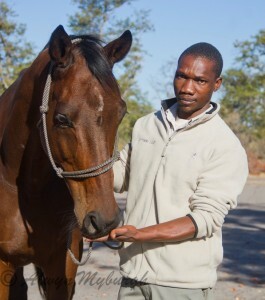 Royal Count made a good recovery although it took time, his trust in humans was not lost and that was the first to mend. 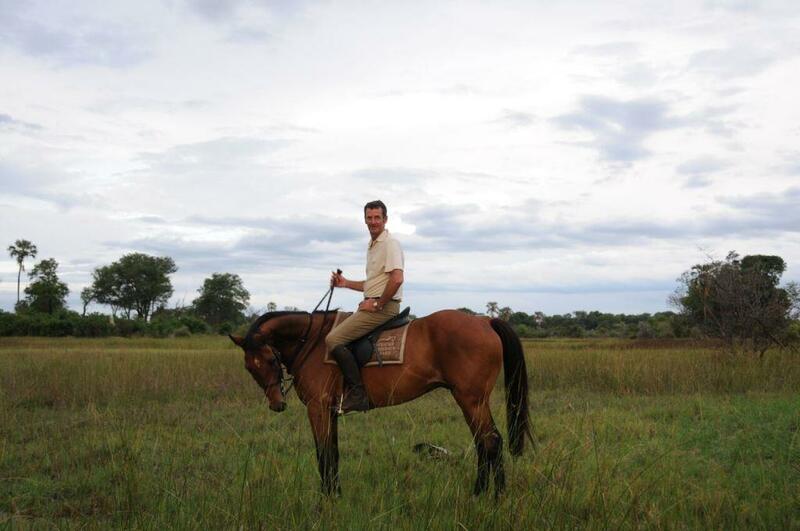 ‘riding with African Horseback in the Okavango Delta ranks as one of the most exhilarating experiences of my life’. 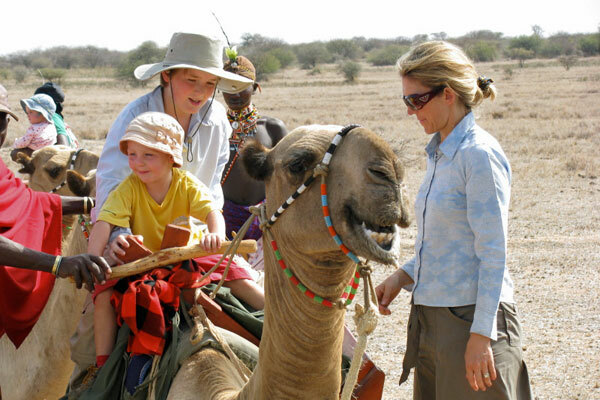 By Charlotte Outram, Offbeat Safaris, Kenya She came to Tristan about seven years ago as a five year old failed polo pony from South Africa. 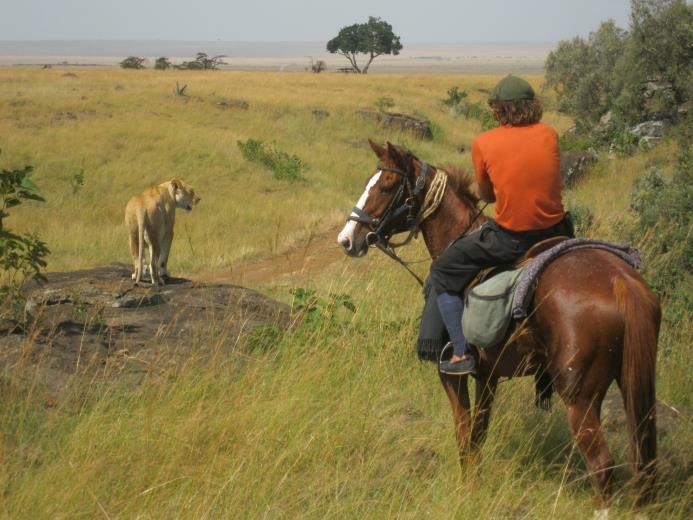 Having absolutely hated polo she quickly turned her hand to safaris and has proved to be one the bravest horses that Tristan and Jakob have ever ridden on safari ….she is particularly brave with lion. She is an amazing lead horse and is not fazed by anything and she truly does have a huge heart…and a huge jump! 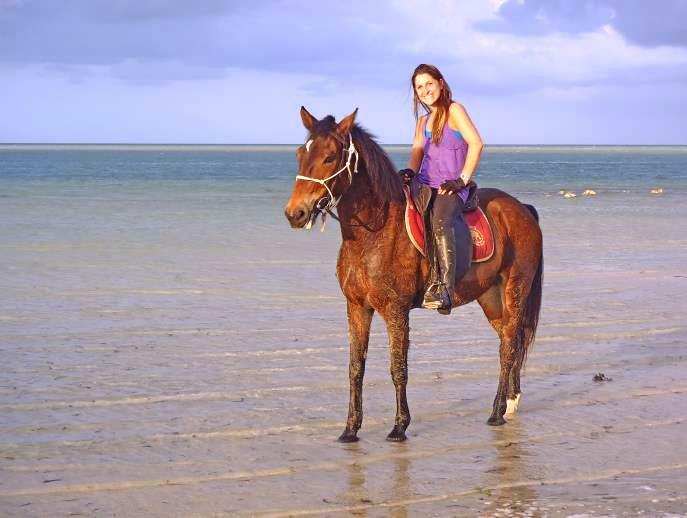 As they say, when you find a good mare you want for nothing else…she is the ultimate safari horse! A horse with a LOT of heart! 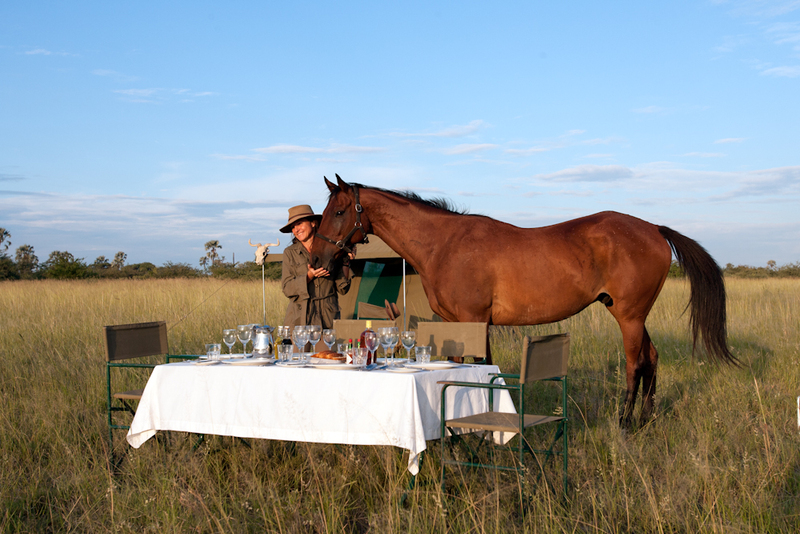 At RAW Botswana’s Motswiri camp, all of our horses are special. They each have their own unique character and personality. The one that deserves a special mention is MR B – his official racing name from another life is MR BEAM. 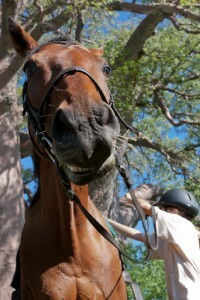 Having grown up as a racehorse in Argentina, he ended his racing career in South Africa. 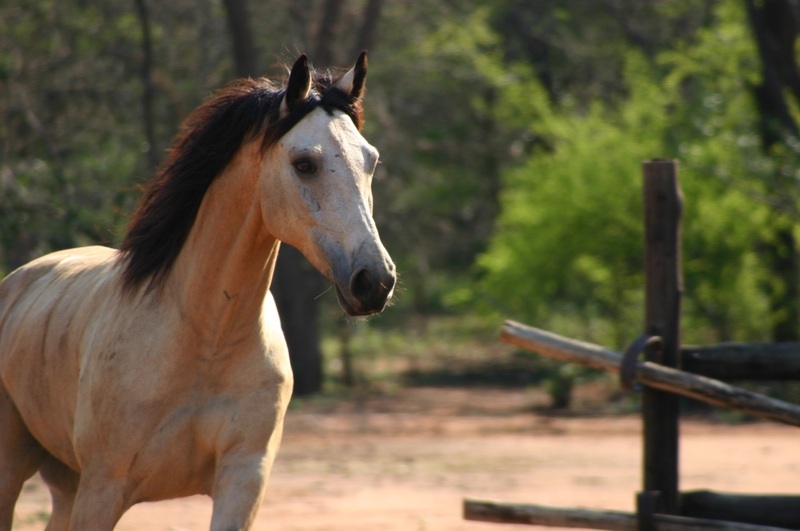 RAW Botswana purchased him from a farm in the Western Cape for a life in the bush and he began his long journey north to Botswana. This must be a traumatic journey for any horse, especially a thoroughbred as they do not generally have the calmest of dispositions! A few days after arrival in camp all mayhem broke loose when a herd of buffalo stampeded through the electric fence surrounding the horse paddock where the horses are turned out each day. Horses were scattered everywhere but by the following evening had generally found their way back to camp. Mr B, however, was heading the wrong way! He was tracked for 35 km from camp, but by day four it became clear that he had headed into a large area of thick bush, impenetrable to vehicles, with no water for survival at a very hot time of year. Sam, camp manager at the time, eventually concluded that the conditions were so extreme that the welfare of the trackers was in serious jeopardy, and took the difficult decision to call off the search. 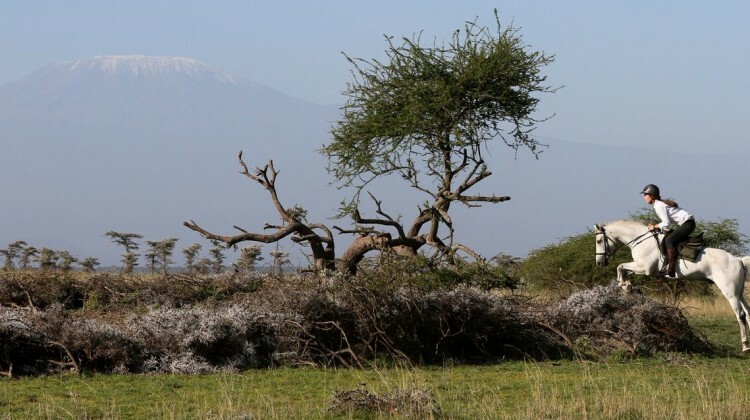 The bush is a harsh environment and has harsh realities – we all feared for and ultimately assumed the worst. Six months later, we received a radio call from the neighbouring concession saying they had seen a horse at one of the pans. Immediately, the expedition began to find our beloved Mr B! 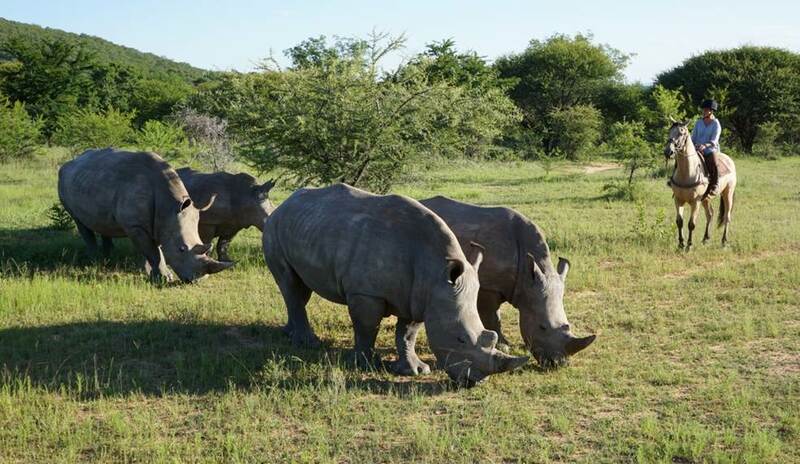 Sam and Ginny, the Stable Manager, aided by two of the best trackers in Botswana, our very own David and Cisco, went off to see if they could find any sign of the missing Mr B. At the first pan searched, Cisco who is a very well known bushman, announced that the tracks were at least two days old. After four hours of further searching Cisco found fresh tracks and was about half an hour behind the horse. Getting closer and with a lot of calling and food rattling around in a bucket, Mr B started to run, his head finally popping out of the thick mopane bush! It was a very moving sight and having given him a quick check over, it was evident that he was in remarkably good condition! A little on the thin side, he was still wearing his head collar and his coat was still glossy. He was led for about half an hour before it became clear that he would not make it all the way back to camp. A loading ramp was fashioned out of a termite mound, and the land cruiser was reversed up to it. Mr B didn’t need any encouragement and stepped straight onto the back of the Land Cruiser. Ten hours later he was back home in the stables in camp. 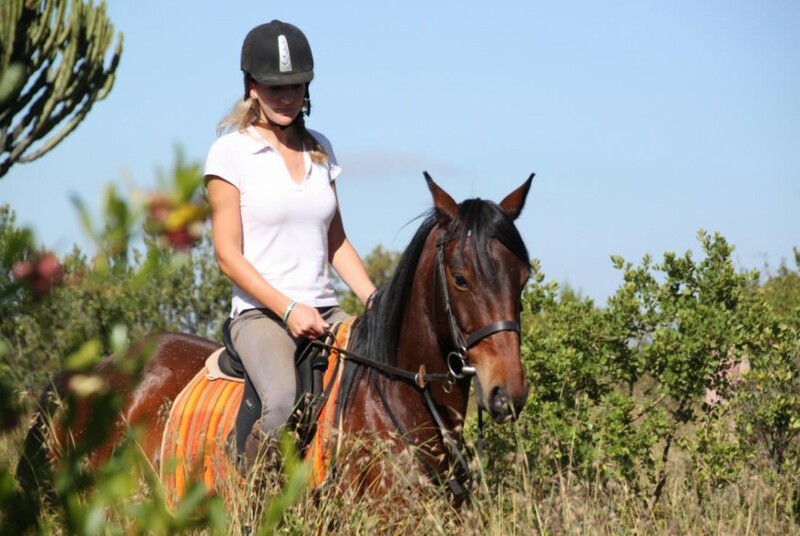 Mr B continues to be one of our most loved and frequently ridden horses and to this day, we still can’t believe that he managed to survive for an incredible six months on his own in the bush! 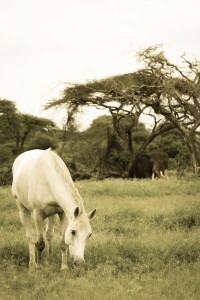 Caspian is without a doubt, one of Africa’s legendary safari horses. 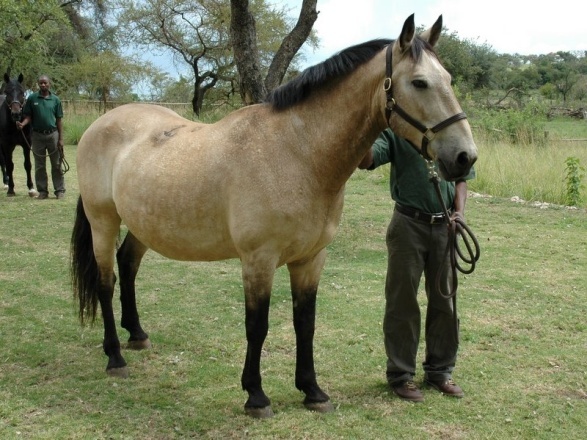 A light bay, thoroughbred cross gelding at 15’2hh tall, his early years were spent in the same game-country made famous in the book, ‘The Flame Trees Of Thika (Kenya), by Elspeth Huxley. 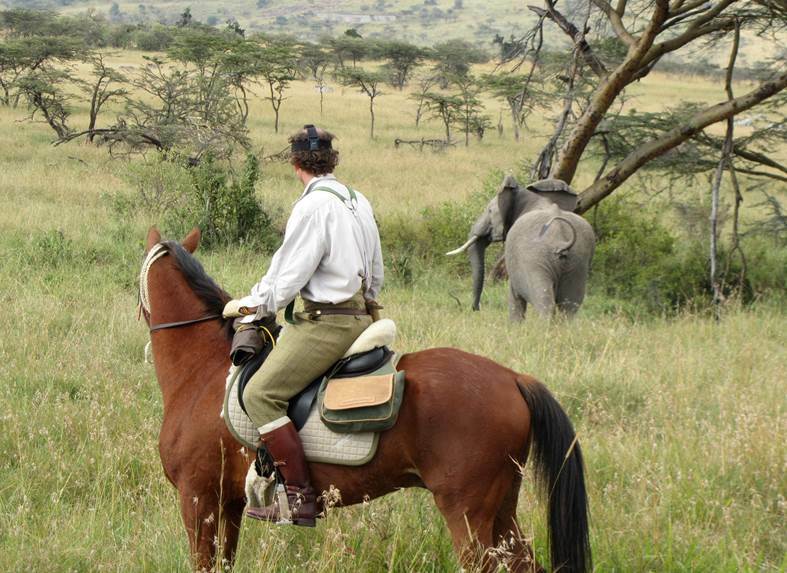 His ancestors starred in the iconic film ‘Out Of Africa’, in which so many of our safari horses featured. Prior to joining the Safaris Unlimited string, he had an unusual career working on the vast pineapple plantations at night on security detail. I then acquired him for the equivalent of £200! 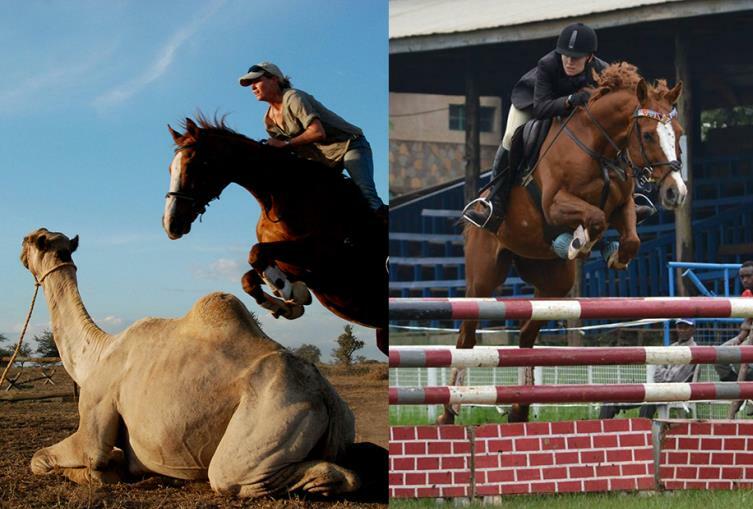 Caspian is the only horse that has ever won the Safari Cup twice. This prestigious cup is awarded to one of our horses that complete the most number of safaris in any given year. In his lifetime with me, he must have covered well over 10,000 miles in the bush. 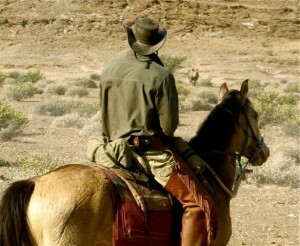 He never missed a safari and was my lead safari horse for ten years. Despite being blind in one eye, he showed incredible courage in big game country, was fearless with lion, and never hesitated to swim the Mara River with all its crocodile and hippo. He is now retired at age 25, at home on our ranch, where he mentors the young horses, envious of his legendary status, in our stable. Despite his life-long career, he is still totally sound, without a single blemish on any of his legs. 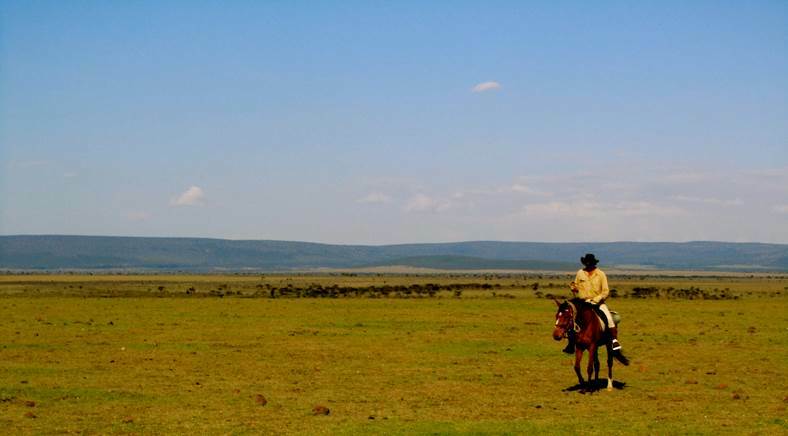 He’s the top safari horse in Africa and that is quite a feat in a horse riding company that has been in business for well over 40 years. 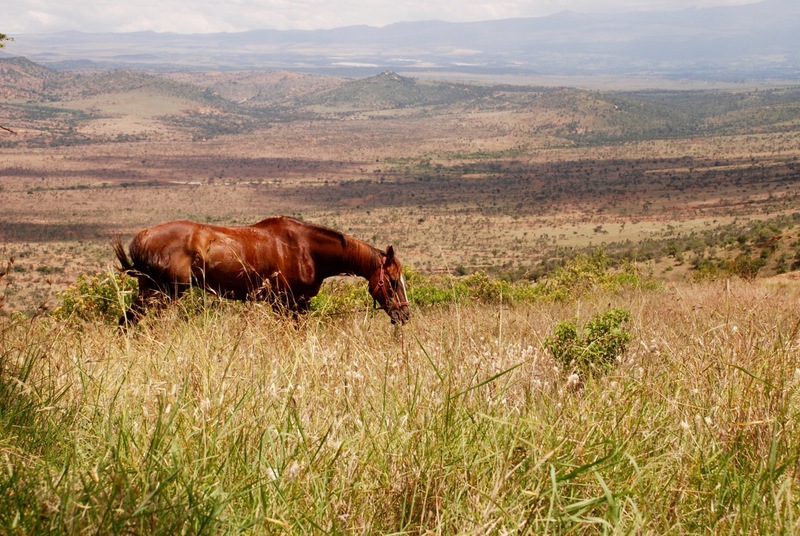 by Kate Ross, GoWild Africa, Kenya Olepangi, our lodge at GoWild Africa, is home to 27 horses which can roughly be grouped into 3 distinct ‘tribes:’ the 16 safari horses, 7 polo ponies, and 4 children’s ponies who roam freely around the farm. 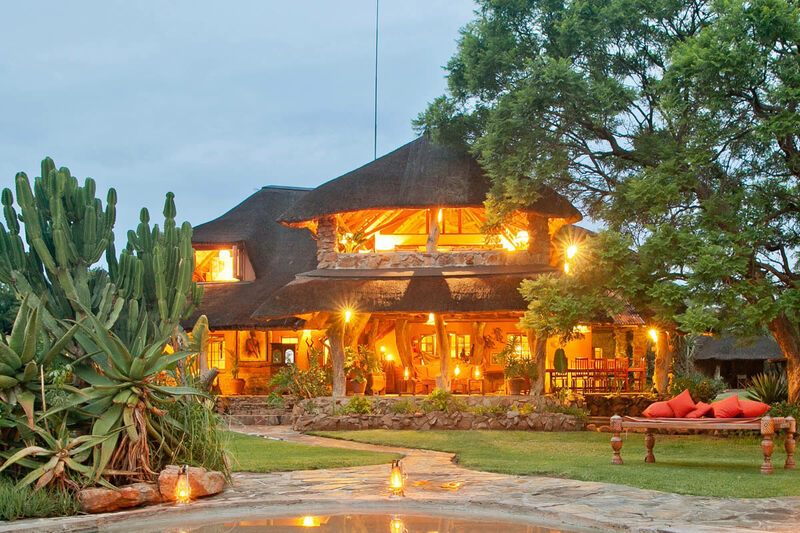 Stabled among the predominantly Thoroughbred safari horses in a lovely courtyard of loose boxes is Mfupi. 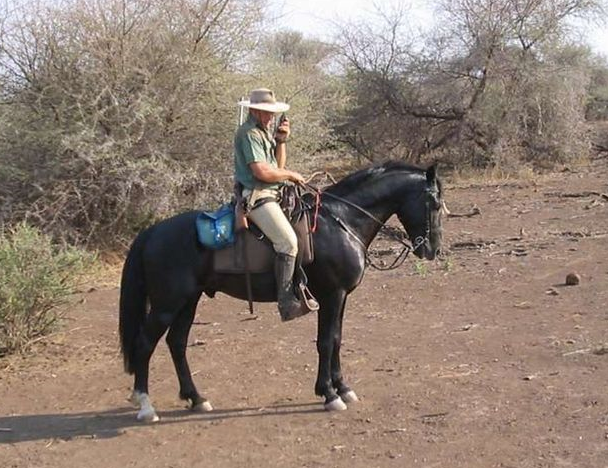 By Louise Carelsen, Limpopo Valley Horse Safaris, South Africa Zulu, a 15.2hh black stallion, was a fantastic bush horse. 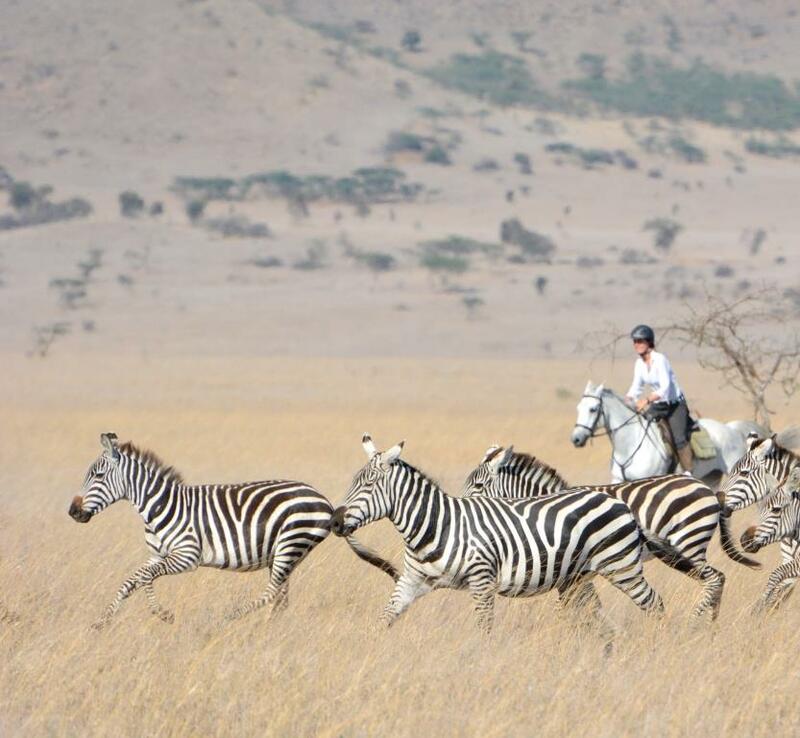 He was Cor’s guide horse for two years after having lived wild with the zebras for the previous two years. He was let loose during the floods of 2000 and didn’t find his way back. Later in 2003 he was spotted by some horse safari guests and people on game drives. Zulu was eventually caught when it got very dry in the bush with some horse cubes and a noose. He was ridden back to the stables the same day, still in fantastic condition, lean and fit, he was able to start working quite quickly. Cor says that when game watching zebras with guests Zulu would still call to them. He was a wonderful horse to learn about the bush on as he would pick up on things happening, just like a wild horse. Otherwise calm and slightly aloof, he was a very pretty little horse. Sadly he died a few years ago, but was a brilliant safari horse. 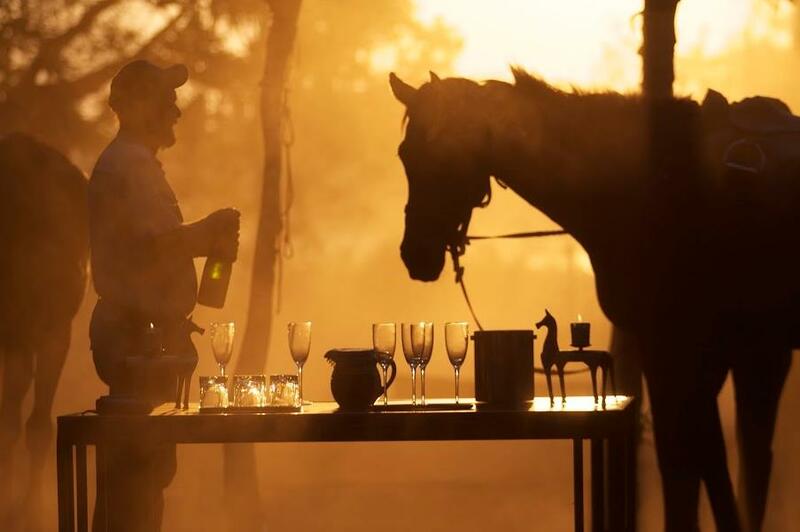 We believe Bonj can lay claim to the most experienced safari horse in Africa as there cannot be many horses that have worked on safari in three different countries – Zimbabwe, Malawi and Botswana – and travelled as many kilometres in between! 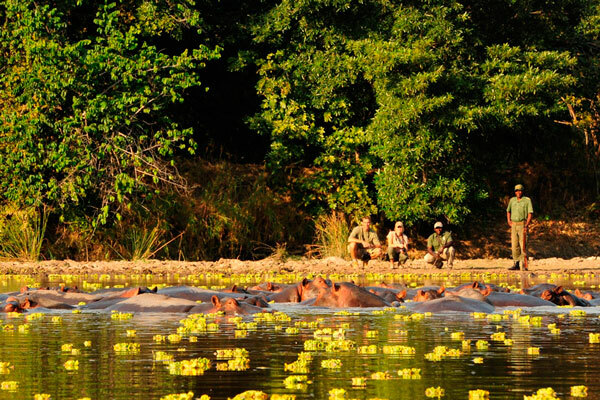 Off the Harare race track Bonj began his safari life with Carew Safaris in the Mavuradonha Wilderness in Zimbabwe. 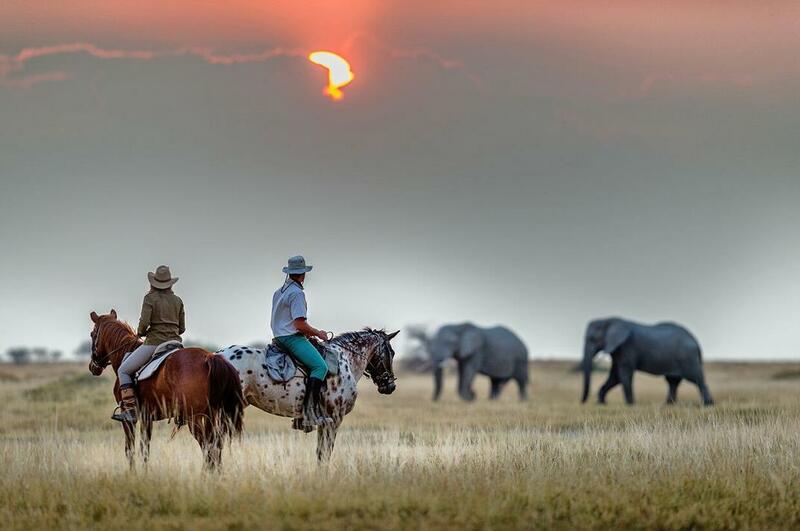 Sadly, soon after his arrival there, the political situation led to the closure of Carew Safaris and, along with seven of his equine companions, Bonj made a 1,800km journey northwards through Mozambique and onto Malawi. En-route, after an overnight rest in Lilongwe, Bonj decided he did not want to go back in the truck, instead throwing himself over in a sickening backwards somersault which resulted in crushed withers. 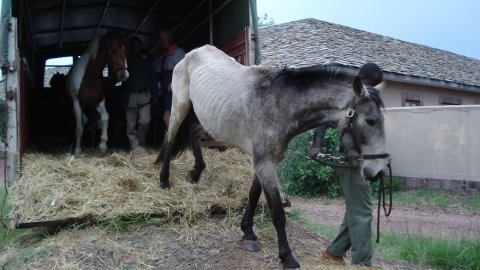 With the reassurance that many horses recover from this injury, and after eight weeks recuperation in Lilongwe (and three days of tempting him into a horsebox), he continued his journey to the Nyika National Park in the far north of Malawi. Here in the cool mountain air he settled into life as one of the most popular in David and Robyn Foot’s string of safari horses. 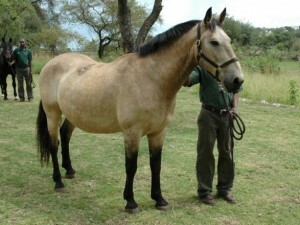 Forward going, comfortable, sure footed, calm – the perfect safari horse. But soon it was time to move again, in what would be the longest journey he would take! With 33 of his companions, he took two days to be ridden out of the Nyika National Park to the nearest town, where he was once again loaded onto a truck as far as Lilongwe for seven week stint in quarantine before a 2,000km journey through Zambia to the Okavango Delta in Botswana. En-route he experienced mile after mile of some of the largest pot holes in Africa, saw in the distance the smoke from “The Smoke that Thunders” (Victoria Falls) and crossed the mighty Zambezi River on a ferry. After a one week rest in Maun, the gateway to the Okavango Delta, it was time to follow his 16 companions from Malawi on a two day ride into this water wonderland. This was going to be a tough challenge for him as he had always been rather nervous of water after being stuck in a Nyika bog for over 12 hours. And after six months of safari work in the Okavango he decided there was just too much water and it was just too flat for his liking after the life he had enjoyed in the mountains in Malawi. So, a two day ride back to Maun began. But after the elephants, buffalo and giraffe of the Okavango, what a fright it was to see a donkey up close! Now, at 18 years of age, Bonj has very happily settled on the edge of the Thamalakane River just outside Maun from where he takes regular trips to the Kalahari on the most spectacular safaris along the edge of the great Makgadikgadi Pans. And being off the Harare racetrack he still manages to retain the “yellow head collar” for winning every gallop across the vast white pans – some of the safest riding ground in Africa.